VPNs are by far the safest way to use the Internet, surely using two VPNs is better? This is a must read for anyone considering VPN tunnel cascading. If you know anything at all about VPNs it is likely you’ve had the thought that if one VPN is good, wouldn’t two VPNs be better? VPN cascading, the official term for double VPN, is both a bonus for users and a possible red flag for ISPs and others who may be monitoring Internet traffic. Why the red flag? Cascading VPN services is a common tactic of people using the Internet for illicit purposes or with something truly valuable to hide because of the high level of security and privacy that it can provide. Before I move on I want to touch base for just a second on what exactly a VPN is. VPN, Virtual Private Network, is a means of connecting to and using the public Internet as if it were your own privately maintained network. When the Internet Protocol came on the scene and made it possible to connect to local and private networks over the phone or other communication lines an instant need was created. A need to make secure connections. Because much of what was being transmitted across the public wires was sensitive in some form or other, remote users needed a way to connect to the home network with safety and privacy and that method is VPN. VPN is the combination of two trains of Internet security: secure connections and encrypted data. It is the result of private sector and US government sponsored work and is as old as the Internet itself. What it does is create a digital tunnel through which your computer or device connects to the Internet. It bypasses your regular ISP to create a direct connection from your device to a dedicated server that authenticates and decrypts your data stream before routing it on to is destination. Once the tunnel is set up your device connects to the Internet in secret and then pops up with a new and anonymous IP address. All of your data, before it leaves your device to travel through the tunnel, is encrypted to ensure an extra layer of safety. The result is an internet connection that is private, undetectable, bypasses geo-restrictions and is near impossible to decipher, and the safest way for anyone to connect to the internet. Picture a house on a street. In front of the house is a mailbox with an address on it. This is your computer and your router, flashing your address for all to see. Anyone driving by can see your address, and when you are sending and receiving mail. They could follow your mail to its destination or track your mail from its destination to you. The mailman is like your ISP. He can see your mail and if he doesn’t like it, or if he thinks you are sending or receiving too much, he can block it. What’s worse, while the mailman is messing around with your mail it’s still out there, for all to see. This is your computer without VPN. Now picture that same house but with a giant tent over it, a tent that you can’t see through. Now imagine digging a tunnel through the floor of that house that goes straight to the post office, but not any old post office, a special safe post office of your choosing. Before going to the post office you put your envelop into a new, anonymous envelope. This way no one can see you send or receive mail, and if they happen to stumble upon it they won’t know where it came from or where it is going. That’s what a VPN does, it masks your computer so that no one can see it, it keeps your IP address safe from prying eyes, it keeps people from seeing when you send and receive connections over the internet and does it all with encryption so they couldn’t read it anyway. In the old days setting up a VPN was hard. It required at least a working knowledge of Internet Protocols if not a degree in computer science. Nowadays, after many improvements and modifications to the technology, it is commercially available to the general public. Providers like Le VPN can grant unlimited use of their services for only a few dollars per month and usually provide dozens of server locations to choose from. Le VPN I know has servers in more than 100 countries around the world providing the most complete coverage of any provider on the market. Using them is also very easy. Once the software is downloaded to your device all it takes is a click to initiate the connection. Once made you secure, or as secure as you can be when using the Internet. Something I always do once I make the VPN connection is clear my cache and cookies so that no stored data inadvertently allows my data to leak. Especially helpful if your intention is to bypass geo-restrictions or avoid geo-detection. So long as your connection is traveling within the first leg of the cascade it benefits from double encryption and double security. Once it exits the cascade it falls back on the safety of the single VPN connection. Some VPN providers like Le VPN do not allow VPN cascading with their VPN service, as the VPN cascading is commonly used for illicit internet activities and Le VPN does not support or allow those, which is also stated in their Terms and Conditions of Service. For informational purpose, we are still going to describe how a VPN cascading works. Setting up a nested cascade is super easy and can be done in a number of ways. Whatever method you choose you will need to have an Internet provider and connection set up at your home or office, and an account with a VPN provider. Let me assure you, setting up a cascade is not as hard as some websites and forums would lead you to believe. Their information is old and out of date. Yes, it is as complicated as they make it sound but with today’s technology is as easy as point and click; you don’t need to have any more knowledge of the Internet than how to log on and surf. The long list of complicated steps to make them work are now incorporated into most VPN providers platforms. If you don’t already have a VPN account you will need to get one. Once that is set up you will need to get your username and password key from your account profile page in order to log onto the VPN servers. I copy and pasted mine to a document file for easy access. Pull up the list of countries with VPN servers. Choose which country you want to use for the first hop and then choose a server with the protocol you want to use. You will find more about the different VPN protocols below. Click on the server of your choice, enter your user ID and password, you’ll get a message when the connection is made. This is your first hop. For the second hop call up the list of countries again, and choose another server to connect with. Click on that server, reenter your user ID and password. The second connection is made. Surf, browse and use the Internet with the highest level of safety that can be provided by the best method on the market. This method is good for a single device and can be used with any wi-fi or LAN connection. Buy a router for your home or office with VPN technology already installed on it. This means that any time you connect to the Internet you will automatically be routed through a VPN tunnel without even having to set it up. You will of course have to purchase a VPN service and Le VPN will be happy to help with that, they’ve partnered with Flash Routers and with SABAI Technology to provide routers with VPN installed. Turn on your computer and download the VPN software. Call up the list of countries with VPN servers and choose one. Click to connect, enter your use ID and password. Now you are cascading the VPN tunnel from your computer through the tunnel created by your router, surf at will. This method is good for a home or business environment where the LAN can be protected by one VPN and individual devices can gain the added security of a nested VPN. 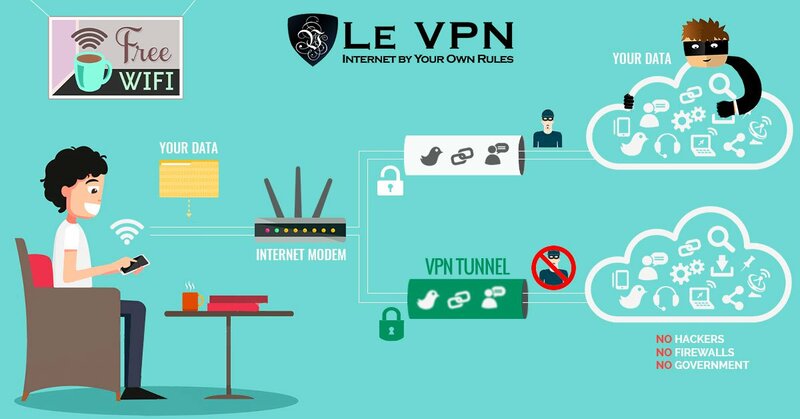 The only downside is that you will need to purchase more than one VPN account, as most VPN providers like Le VPN do not allow VPN cascading or a double VPN connection (even though two simultaneous connections are allowed but on two different devices, like your smart phone and your computer). Buy two VPN enabled routers, and get a VPN account. Set up a nested configuration with the routers, using different VPN servers for each. Voila! You and every device that connects to the Internet through your router/wi-fi will automatically be connected with a VPN router cascade. Surf at will knowing that you, your family, your business and all your Internet of Things connected devices are as secure, safe and anonymous as they can be. Please note that VPN cascading does not provide much of an additional value, as a secure VPN connection with Le VPN is enough to protect your Internet activities as individuals, families or businesses. A single Le VPN account can protect all devices using the router set-up without using VPN cascading. Over the years there have been a number of advancements to VPN technology that have resulted in 3 specific protocols with varying degrees of safety. 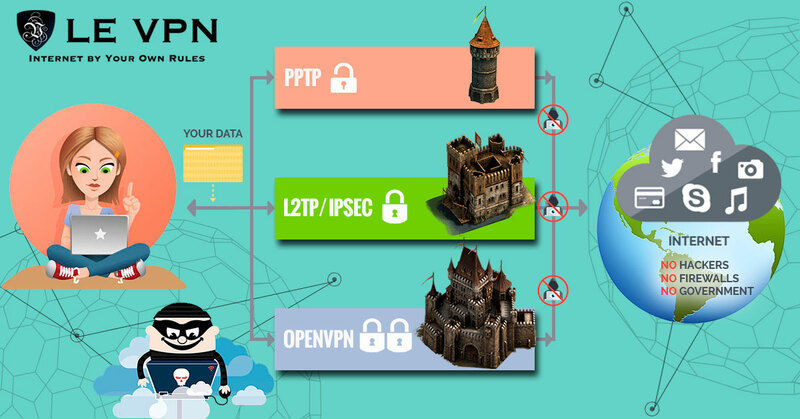 These are PPTP, L2TP and OpenVPN. PPTP, point-to-point tunneling protocol, is the earliest and least secure form. It creates the secure connection but does not use encryption. It’s good for basic safety, as a backstop for anti-virus, anti-malware and Internet Best Practices, and is generally used for web surfing and low-level Internet interactions. L2TP, level 2 tunneling protocol, is the next generation and includes high-level encryption as well as secure connections to ensure privacy and safety. This protocol is best used for more sensitive web browsing such as visits to the online bank or other financial transactions. The downside is that with the extra layer of security comes a bit more latency than with the standard PPTP. OpenVPN is an open source form of VPN and the best available today. It uses the highest level of encryption and authentication over secure connections to provide the most safety and security available. The major advantages of OpenVPN include the ability to bypass most firewalls and network/ISP restrictions. In my experience latency is not generally a problem unless you are streaming media or other high bandwidth use of the Internet, and if you are doing that there is a better way. 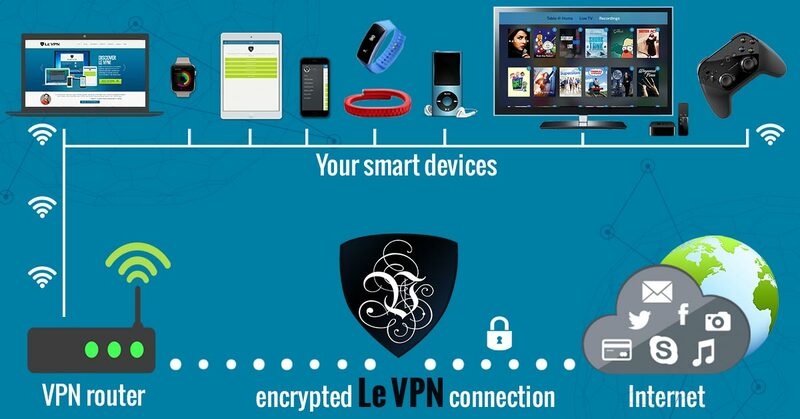 Le VPN offers a HybridVPN connection that combines the fastest available VPN with SmartDNS to unlock and stream geo-restricted digital media. Should You Be Using A VPN Cascade? Even though there are many benefits of VPN cascading, our answer is No. Using a single encrypted VPN connection should be enough for any internet user to stay safe and secure online. No need to use a double VPN connection of the VPN cascading and ruin your online reputation with your ISP and your VPN provider who will detect it and block you “just in case”. Yes, the internet is filled with danger, not even considering the fact that there are MILLIONS of viruses and malware seeking to take over your device and all of your identifiable information, and there is always the chance of a simple leak that allows someone access to your Facebook, potentially embarrassing, or your bank account, potentially catastrophic. The need for a reliable and trusted VPN service is clear. It’s cheap, it’s easy and it will save you untold hours of headache and expense so there is just no reason to wait. Get Le VPN before it’s too late.